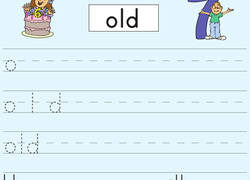 Write the Sight Words: "Old"
Help your child learn the sight word "old" with this printable phonics worksheet. 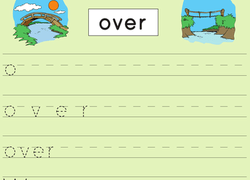 Write the Sight Words: "Over"
Help your child learn the sight word "over" with this printable phonics worksheet. Help your child learn new words and introduced him to alphabetical order with this alphabet word search featuring M, N, and O. Take a vocabulary-building vacation with this travel word scramble, full of vehicle words that need to be re-arranged and spelled correctly! Build spelling and logic skills with a fun word scramble, featuring some fresh and fruity words! 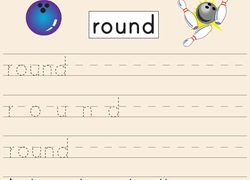 Help your child learn the sight word "any" with this printable phonics worksheet. 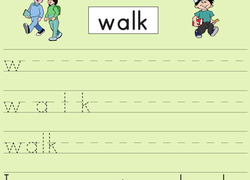 Write the Sight Words: "By"
Help your child learn the sight word "by" with this printable phonics worksheet. 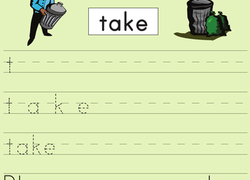 Write the Sight Words: "Take"
Help your child learn the sight word "take" with this printable phonics worksheet. 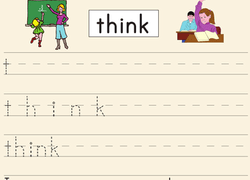 Write the Sight Words: "Think"
Help your child learn the sight word "think" with this printable phonics worksheet. As your child completes this sight word worksheet, featuring the word "three," she'll get practise with writing, drawing, and counting, too! Use this glossary with the EL Support Lesson Plan: Word Detectives. 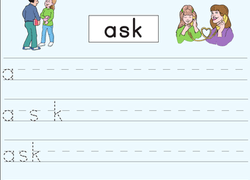 Write the Sight Words: "Ask"
Help your child learn the sight word "ask" with this printable phonics worksheet. 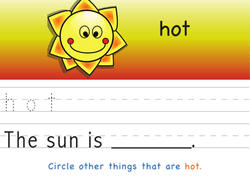 Heat up your child's sight word learning with this worksheet, featuring the word "hot." 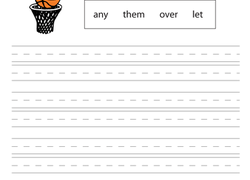 This worksheet's all about the word 'big': have your child trace the word first, then try writing it on his own. This worksheet will help build your kindergartener's vocabulary, spelling, and handwriting skills. Kids trace the word "black", then use it in a sentence. Have a blast looking for words that begin with the letters W and Y in this alphabet word search! Make sure you check your answers on the answer sheet. Learn the different parts of a blouse with this fun match-up activity! Your little one can learn a few new sight words, all about the clothes we wear. 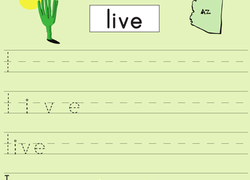 The best way to learn new words is to practise them in context, and this worksheet allows kids to use the word "live" in a sentence.